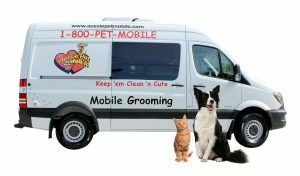 Aussie Pet Mobile has been operating in the Central Florida area for 9 years. We could not have done this without you, our client families, and we’d like to thank you for your support and confidence. It is a privilege to be permitted to care for your fur-child. Our mission is simple: We take care of family members. Here at Aussie Pet Mobile of SE Orlando, we strive to ensure that the right groomer is matched to your type of pet. We have groomers that are especially skillful with cats or particular breeds of dogs. We even have groomers that are skilled in treating severely matted pets. In addition, most of our groomers have been with us for over 6 years and we are very proud of this. Employee retention is vital to client retention and satisfaction. Our groomers undergo full background checks every year. All groomers are full employees complete with benefits and performance bonuses. We routinely bring in additional training resources so our groomers not only continue to improve their grooming skills, they also develop skills in pet behavior and client relationship building. We strive to make sure our groomers have enough travel time between appointments and we do not limit areas to specific days. Dispatchers are on hand 7 days a week and we return phone messages within an hour or at the beginning of the next day. Voice greetings will always inform you as to when your call will be returned in case we must be away from the phones or it is after hours. Scheduling is done through a cloud-based client management system which is accessed by all associates. Clients have their own record complete with a full history of appointments, specifics of grooms, preferences, past groom times based on the van tracking, preferred days/times and specific pet data. Appointment confirmations are done 2 days in advance by phone and we have an electronic process to manage standby requests. All vans host a tracking system and our dispatchers know where the vans are at any given moment. Grooming vans are complicated vehicles. There’s a lot of delicate equipment on board and the constant presence of hair and water can cause equipment glitches. At our van facility, we have a full stock of spare parts and equipment.We have our own mechanic who will stay until the wee hours of the night to replace or repair equipment and to perform most general maintenance on the van itself. If any van has an operational issue during the day, we can even move the groomer to a spare van that is always on hand and let him/her continue her day as uninterrupted as possible. We have done everything possible to attempt to eliminate situations where an entire day of appointments has to be cancelled out. Our business is fully insured for professional liability, property damage and worker injury. This is for both our associates’ and clients’ protection. And while groomers in Florida do not require a special certification, our Aussie does employ an Aussie trainer who is approved to train other groomers. She makes sure groomer skills continue to improve. And is there a downside to all this? Sort of. It does mean that our vans are often fully booked from 4-12 days out during some months of the year.It also means that we are more expensive than single unit owner operators. But nobody else in Orlando can provide this type of added value to their clients. The good news on that is there has been considerable investment in this operation in order to raise the level of reliability, continuity and internal communications. We have done as much as possible to give our groomers all the resources and tools they need to perform at their best.